Recording your blood pressure is difficult. While there are a number of conventional blood pressure cuffs that supposedly allow you to do this yourself, they are awkward at best, and often infuriating. Not so the Withings Blood Pressure Monitor. The cuff looks like a standard blood pressure cuff, only with an aluminum tube and a dangling cable. The cable is terminated by an iPhone plug (the older one, not the new iPhone 5 style). 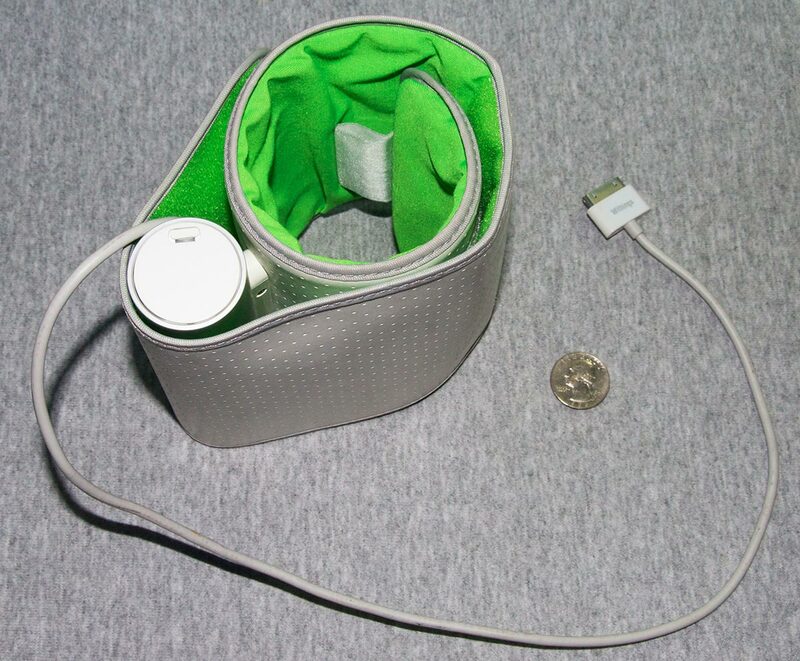 The aluminum tube holds four AAA batteries and the electronics for the cuff, including the pump to inflate it (Figure 1). Figure 1: The blood pressure monitor holds four AAA batteries plus the electronics in the aluminum tube. The cuff itself has Velcro to make sure it has a secure fit. Click on the image for a larger version. Plug the cable into an iPhone or iPad (you will need an adapter, obviously, for the iPhone 5 or iPad mini), and the companion Withings app launches. The app guides you through simple instructions on how to take your blood pressure (sit down, sit straight, put your feet flat on the floor, etc.) and then, after you press Start, inflates the cuff and records the reading. The results are color coded, so even if you didn't know that 148 over 110 was bad, the color coding will give you a clue. The results are also transmitted (in this case, by the iPad or iPhone) to the Withings Web site, where you can log in via a Web browser and see your history. Of course, the history is also shown on your iPhone or iPad, in both tabular form and in nice, pretty graphs (Figures 2, 3). 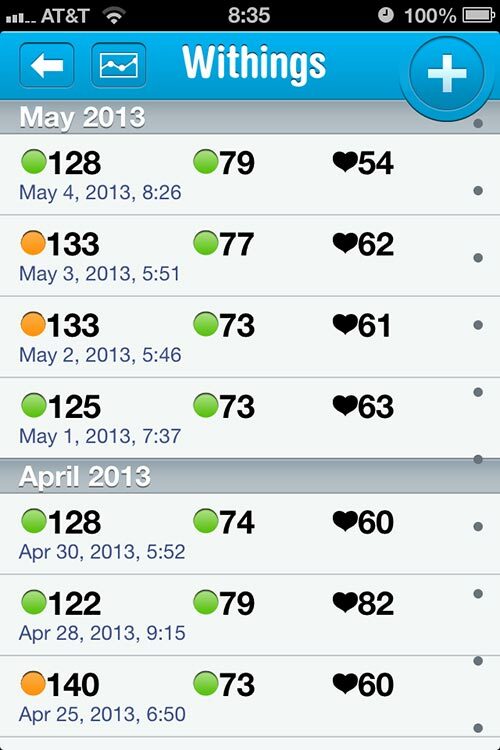 Figure 2: Blood pressure readings on an iPhone are compact, with color-coded dots telling you if an individual reading is good, poor, or bad, and including a date and time stamp. The graph shows trends over time. Click on the image for a slightly larger view. 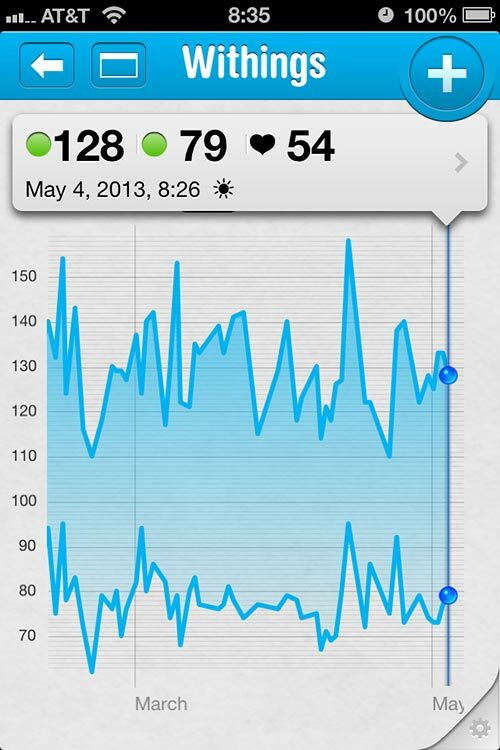 Figure 3: You can also select a screen that gives a tabular listing of blood pressure readings over time. Click on image for a slightly larger version. This alone would be a huge advance for most people -- fast, accurate blood pressure measurements, without a health care appointment -- but your Mac and your iPhone allow you to do even more. If you don’t take your blood pressure for several days, the Withings app will put up a little red notification on the app icon (Apple calls this a “badge app icon”) that says, in essence, “pay attention to me.” Launching the Withings app will then inform you that you need to take your blood pressure. Nagging, yes, but a very gentle, low pressure nagging. You can also sign up for Withings to send you periodic E-mail notifications. The Withings web site, iPhone app and iPad app all present the same information, but the iPhone app is pared down to the bare essentials due to space limitations. 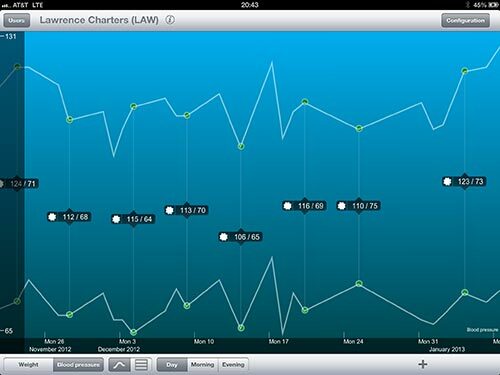 On an iPad or the Withings web site, information is designed to take advantage of the extra space, and you can pinch or stretch the graph to show shorter or extended periods of time, or select just morning or evening readings (Figures 4, 5). 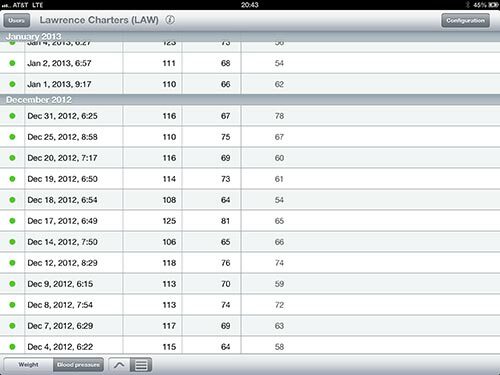 Figure 4: This view, shown on an iPad, displays morning readings over a period from November 2012 to January 2013. Icons at the bottom allow you to switch to a tabular view, or display just morning or evening readings. The view on the Withings website closely matches the iPad view. Click on the image for a larger view. Figure 5: Physicians and nurses very much appreciate the tabular view, as it compactly presents the blood pressure data in a clear manner. Click on the image for a larger version. The same iPhone and iPad app can also be used with the Withings Wireless Scale, but that is the subject of a different article. $129.95. The monitor is also available through Apple’s on-line store as well as at the larger brick-and-mortar Apple Stores.